Salmonella food poisoning is a bacterial infection that causes inflammation (swelling) of the lining of the stomach and intestines ( gastroenteritis ). The causative bacteria is called Salmonella . While domestic and wild animals, including poultry, pigs, cattle, and pets such as turtles, iguanas, chicks, dogs, and cats can transmit this illness, most people become infected by ingesting foods contaminated with significant amounts of the causative bacteria. Improperly handled or undercooked poultry and eggs are the foods which most frequently cause salmonella food poisoning. Chickens are a major carrier of salmonella bacteria, which accounts for its prominence in poultry products. However, identifying foods which may be contaminated with salmonella is particularly difficult because infected chickens typically show no signs or symptoms. Since infected chickens have no identifying characteristics, these chickens go on to lay eggs or to be used as meat. At one time, it was thought that salmonella bacteria were only found in eggs which had cracked, thus allowing the bacteria to enter. Ultimately, it was learned that, because the egg shell has tiny pores, even uncracked eggs which sat for a time on a surface (nest) contaminated with salmonella could themselves become contaminated. It is known also that the bacteria can be passed from the infected female chicken directly into the substance of the egg before the shell has formed around it. Anyone may contract salmonella food poisoning, but the disease is most serious in infants, the elderly, and individuals with weakened immune systems. In these individuals, the infection may spread from the intestines to the blood stream and then to other body sites, causing death unless the person is treated promptly with antibiotics . In addition, people who have had part or all of their stomach or their spleen removed or who have sickle cell anemia , cirrhosis of the liver, leukemia, lymphoma, malaria, louse-borne relapsing fever, or acquired Immunodeficiency syndrome ( AIDS ) are particularly susceptible to salmonella food poisoning. Although salmonella food poisoning occurs worldwide, it is most frequently reported in North America and Europe. Only a small proportion of infected people are tested and diagnosed, and as few as 1 percent of cases are actually reported. While the infection rate may seem relatively low, even an attack rate of less than 0.5 percent in such a large number of exposures results in many infected individuals. The poisoning typically occurs in small, localized outbreaks in the general population or in large outbreaks in hospitals, restaurants, or institutions for children or the elderly. In the United States, salmonella is responsible for about 15 percent of all cases of food poisoning. Salmonella food poisoning can occur when someone drinks unpasteurized milk or eats undercooked chicken or eggs, or salad dressings or desserts which contain raw eggs. Even if salmonella-containing foods such as chicken are thoroughly cooked, any food can become contaminated during preparation if conditions and equipment for food preparation are unsanitary. Other foods can then be accidentally contaminated if they come into contact with infected surfaces. In addition, children have become ill after playing with turtles or iguanas and then eating without washing their hands. Because the bacteria are shed in the feces for weeks after infection with salmonella, poor hygiene can allow such a carrier to spread the infection to others. Symptoms appear about one to two days after infection and include fever (in 50% of patients), nausea and vomiting , diarrhea , and abdominal cramps and pain . The diarrhea is usually very liquid and rarely contains mucus or blood. Diarrhea usually lasts for about four days. The illness usually ends in about five to seven days. Under appropriate laboratory conditions, salmonella can be grown and then viewed under a microscope for identification. Early in the infection, the blood is far more likely to positively show a presence of the salmonella bacterium when a sample is grown on a nutrient substance (culture) for identification purposes. Eventually, however, positive cultures can be obtained from the stool and in some cases from a urine culture. 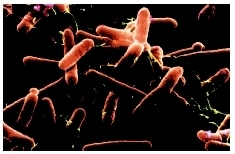 Exposure to the Salmonella enteritidis bacterium usually occurs by contact with contaminated food. does not usually reduce the length of time that the patient is ill. Paradoxically, it appears that antibiotics do, however, cause the patient to shed bacteria in their feces for a longer period of time. In order to decrease the length of time that a particular individual is a carrier who can spread the disease, antibiotics are generally not given. In situations where an individual has a more severe type of infection with salmonella bacteria, a number of antibiotics may be used. Chloramphenicol was the first antibiotic successfully used to treat salmonella food poisoning. It is still a drug of choice in developing countries because it is so inexpensive, although some resistance has developed to it. Ampicillin and trimethoprim-sulfonamide have been used successfully in the treatment of infections caused by chloramphenicol-resistant strains. Newer types of antibiotics, such as cephalosporin or quinolone, are also effective. These drugs can be given by mouth or through a needle in the vein (intravenously) for very ill patients. With effective antibiotic therapy, patients feel better in 24 to 48 hours, the temperature returns to normal in three to five days, and the patient is generally recovered by ten to 14 days. The prognosis for uncomplicated cases of salmonella food poisoning is excellent. Most people recover completely within a week's time. In cases in which other medical problems complicate the illness, prognosis depends on the severity of the other medical conditions, as well as the specific organ system infected with salmonella. Prevention of salmonella food poisoning involves the proper handling and cooking of foods likely to carry the bacteria. This means that recipes utilizing uncooked eggs (Caesar salad dressing, meringue toppings, mousses) need to be modified to eliminate the raw eggs. Not only should chicken be cooked thoroughly, until no pink juices flow, but all surfaces and utensils used on raw chicken must be carefully cleaned to prevent salmonella from contaminating other foods. Careful hand washing is a must before, during, and after all food preparation involving eggs and poultry. Hand washing is also important after handling and playing with pets such as turtles, iguanas, chicks, dogs and cats. Because children are notoriously bad at hand washing, parents want to be particularly vigilant to make sure that careful hand washing is followed, especially if someone in the home is actually ill with salmonella food poisoning. In this case, extra precautions should be taken. Children should not share foods, utensils, beverages, etc. Hand washing after toileting or diaper changes should be undertaken with extra care to avoid spreading the infection to others. The healthcare provider should give the family guidance regarding when a recovering child should return to school or daycare. Carrier —A person who possesses a gene for an abnormal trait without showing signs of the disorder. The person may pass the abnormal gene on to offspring. Also refers to a person who has a particular disease agent present within his/her body, and can pass this agent on to others, but who displays no symptoms of infection. Gastroenteritis —Inflammation of the stomach and intestines that usually causes nausea, vomiting, diarrhea, abdominal pain, and cramps. Cleary, Thomas G. "Salmonella." In Nelson Textbook of Pediatrics . Edited by Richard E. Behrman et al. Philadelphia: Saunders, 2004. Eisenstein, Barry I., and Dori F. Zaleznik. "Enterobacteriaceae." In Principles and Practice of Infectious Diseases . Edited by Gerald L. Mandell. London: Churchill Livingstone, Inc., 2000. Centers for Disease Control and Prevention. 1600 Clifton Rd., NE, Atlanta, GA 30333. Web site: http://www.cdc.gov.